Scale resources according to your dealflow – rather than the other way around. StealthForce.com has built an army of real estate investment professionals from analyst level through C-suite, and designed a platform which makes them available for project-based consulting, on-demand. Investors, developers, auditors, family offices and even CREtech startups leverage their network to hire conflict-free, experienced industry veterans for everything from building an excel model to building SOPs for asset management. StealthForce launched as the gig economy of commercial real estate, but is rapidly expanding through integration partnerships to become the Trello of real estate insight, software and talent resourcing. This will be their fourth CRE // Tech. Our team at CRE // Tech recently caught up with StealthForce to learn more about their site, strategy and vision. StealthForce is the global rolodex of a real estate stakeholder’s dreams. We scope projects, define deliverables, vet for conflict and match consultants with clients who want to hire them by the day, by the project, or as a test-drive for a permanent role. Our fee is a percentage of the project total. Currently we’re building out integrations with CREtech software providers whose tools can add even more value for our clients on a project-basis. We serve investors, developers, funds and related third-parties looking to streamline their operations (brokerages, accounting firms, etc.). Our typical user is a director of acquisitions or asset management, or a principal investor. What they all have in common is a need for targeted insight, and an appreciation for flexible support. Unlike other gig economy platforms like UpWork, we focus exclusively on real estate talent, enabling us to not only productize many of the items a typical client will need to move through the deal cycle, but also to design the entire process in a way which protects both parties. And the caliber of our talent is a testament to that. Unlike leveraging outsourcing companies like Situs, you personally select your consultant on each project, and work directly with that person, to get the work done correctly the first time. And unlike hiring a recruiter, when you use StealthForce and then hire someone full-time, you’ve had the chance to effectively rent them before you buy. Business is growing! Quarter over quarter our pipeline has nearly tripled, and in particular we’ve begun to develop strong word-of-mouth. Not only are our clients telling others about us, but some of our consultants have become clients as well. This fall, our Founder will be speaking or moderating panels at ULI, CCIM, ICSC and more, which should provide an additional boost to our reach. Next up for us is raising another round of financing, and building out our roster of software integration partners. The prototype of our project management system has been well received, and we look forward to building version 2.0, which will not only reduce match times from two days to a matter of hours, but will arm them with quick trials of fantastic softwares which they may be considering integrating across their companies at a later date, an on a permanent basis. For us, it has always been about enhancing efficiency in resourcing. We’ve got our sights set far beyond talent. Come meet StealthForce at CRE // Tech New York on December 7th and follow them on twitter @Stealthforceco! 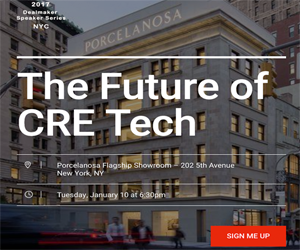 To learn more about our upcoming events in Los Angeles on September 28 at CBRE Headquarters in Downtown and New York on December 7 at SL Green’s 55 West 46th Street, to become an exhibitor or to purchase tickets, visit www.cretech.com.